Theme parks are mysterious organisms that usually have good reasons for making big changes. But taking down the Monster Sound Show may have been a bit premature, and I wonder, is there any way to bring it back? Monster Sound Show was a near perfect attraction in every way. The premise was fun. An audience filled a theater with a movie screen and plenty of sound equipment on a stage. 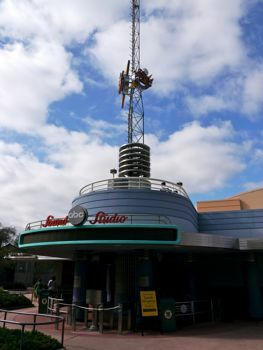 The equipment (created by Disney sound legend Jimmy MacDonald) included things such as a giant metallic sheet that sounded like lightning when shaken vigorously. First the audience watched a short movie. Four volunteers that were chosen in the waiting line (while a David Letterman introduction video was played) then came up and used the sound equipment to match the sound effects in the film, recording a new track as the movie played a second time. Hilarity ensued, as audience members aren’t trained sound technicians, and many errors were made. 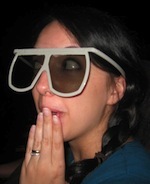 After the audience members did their thing, the sound effects were humorously out-of-synch with the actions onscreen when the movie was played a third and final time, using the new soundtrack. For example, my mother was in charge of the sound of the chandelier dropping. She got to it late, therefore it recorded late. Meaning the crashing sound came a few seconds after the chandelier fell. It may not sound funny, but you had to be there, and if you were, you would’ve been cracking up. I like to pretend that it looks like the studio backlot from Pee-Wee’s Big Adventure, but hey, that’s just me. I know it’s far less glamorous in reality – probably just a lot of golf carts and people in Polo shirts or something. But you have to get your kicks where you can find them, right? Right. As long as it’s not somebody mopping the floor while smoking a cigarette, I’m happy. 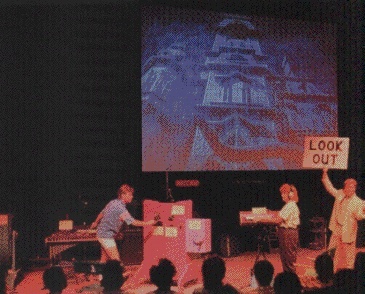 Anyway, as if the concept of the show weren’t fun enough, the film featured at the Monster Sound Show was a horror comedy short starring – wait for it, Chevy Chase and Martin Short. Yeah, that’s right, two of the Three Amigos inhabited one Disney attraction. They are comedy legends, seemingly performing for your entertainment daily. Some parts of the show I remember very clearly, Martin Short playing a creepy butler, Chevy Chase selling insurance door-to-door at the house where Short was the butler. There were creaking doors and creaking floors, falling chandeliers and I believe there was a ghoul with a very long tongue at the end of the film that actually gave me a genuine fright as a kid. I believe the film was called Death of a Salesman, but I wouldn’t trust my memory enough to bet on that. It almost felt like an extension of the Haunted Mansion over at the Magic Kingdom or a sister to the Tower of Terror, which opened in 1994. There is very little information floating around on the Internet about Monster Sound Show, especially compared to all of the YouTube videos of most rides you can find today. The details I crave simply aren’t to be found. The show closed in 1997, meaning it sort of just missed the boat on people uploading their vacation videos when the show was still running. I wonder where the actual short film is, and I’m desperate to see it again. Perhaps it’s sealed away in a crate somewhere in some giant Disney warehouse, next to the arc of the covenant and props from Mr. Toad’s wild ride. I’d like to propose that Monster Sound Show be resurrected. If Captain Eo is getting a second chance, this one should too. It’s been gone long enough that people who maybe didn’t like it before can now enjoy its “vintage” feel. The attraction where the Monster Sound Show used to be is now Sounds Dangerous, staring Drew Carey. Listen, I like Drew Carey just as much as the next guy. I really do. But the majority of the show occurs in a completely blacked out theater and mostly features that wacky future technology called (drumroll please) … surround sound. Which, if I recall, was used in a smaller similar attraction in the post-show area for the Monster Sound Show called Soundworks. I believe it’s still open, when Sounds Dangerous is running. 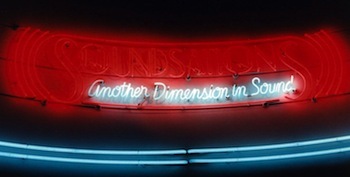 Soundworks is similar to the technological playgrounds you can find after riding the Journey of Imagination with Figment and seeing The Magic of Disney Animation. 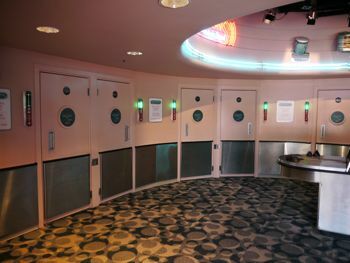 It provides guests the chance to play with sound effects from Roger Rabbit as well as Forbidden Planet. The inspiration for Sounds Dangerous is much smaller. You step into a booth, put on headphones and listen to a kind of Sam Spade audio show with the sharp sounds of arrows and bullets whizzing past your head. This was, no doubt, the spark of the idea to have Drew Carey play a security guard that ends up entangled in a strange mystery that takes him into all sorts of strange situations giving the audience a kind of 3D audio encounter. If anyone remembers any details about the Monster Sound Show or has any video footage, please post below. There are several great Web sites dedicated to rides long since gone, Yesterland, Extinct Attractions and more. So obviously, this is an area of interest to many theme park geeks like myself. Wouldn’t it be nice to have a park dedicated to the attractions most parks don’t want anymore? We’d have the Smurf dark ride from King’s Island, The Monster Sound Show and many others we could revel in. Many attractions have come and gone, been changed and rehabbed. Which ones would you love to have the chance to experience just one more time? • Audrey is a freelance writer and voice over artist. Her work has appeared in “Geek Monthly”, “Animation World”, “Haunted Attractions”, “Orlando Attractions Magazine” (print edition) and more. She is currently pursuing her MA in creative writing in the midwest. She escapes to Orlando as often as humanly possible, where she has spent an inordinate amount of time vacationing and would take up residence in the Haunted Mansion if she only could. Great article. I was 26 the first time I went to WDW so I never got to see The Monster Sound Show, so this piece helped me imagine how awesome it would have been. Can’t wait for the next trip down memory lane. I just wrote you the neatest message and when I forgot to put it my e-mail address it was LOST so here is a boring message instead… which will no doubt go through when the funny one didn’t. I did not realise that when I was having such fun doing mismatched sound effects that one little sponge-brained daughter was recording a precious memory for family posterity!!! Thank you for you your android-like memory mind! Tpvl pm eof fs gimmu smf [pdoyobr ejovj er s;; mrrf om yjod yrttptody=jsimyrf. ;smhishr [p;;iyopm fotyu=eptf [pyyu=,piyjrf upiyjr=grdy oops! One space over and we write Martian, oh well, leave it in for a laugh. Here is your assignment , translate by moving over one space and see what mama really said, Oooosh! I’m going out ot play in the dirt and weeds at least they don’t disappear after alll the hard work! Sheesh! I, too, would love to see this return. I was lucky enough to be chosen to participate in 1994. My Mom had her videocamera and taped part of the pre-show, but was told it had to be turned off when we entered. When I was selected she asked if there weren’t any way they would let her film me. They said it was a copyright issue – none of the film could be taped. After good Mommy pleading, the castmembers talked to one another, then agreed she could take a couple shots during the time the movie was not playing. So we have a little film, but not all that we would like. Since secretly recording was trickier back then – no little digital cameras – I expect there isn’t much footage. At least Mom got a little on VHS — she had a nice big VHS ones — like holding a full VCR on your shoulder. Marilyn, let us know if you ever get the footage online. I’d love to see what you have. Hey Marilyn, I remember those VHS recorders! They were so huge, weren’t they? I remember how the red light on front would just sort of blare like a sight on a shotgun, I bet it would’ve been really hard t record anything in secret, haha! I’ve never thought before about that being why there aren’t as many retro ride videos. Good call! It’s been edited, but there is a youtube upload showing the bulk of the show inside the theater.